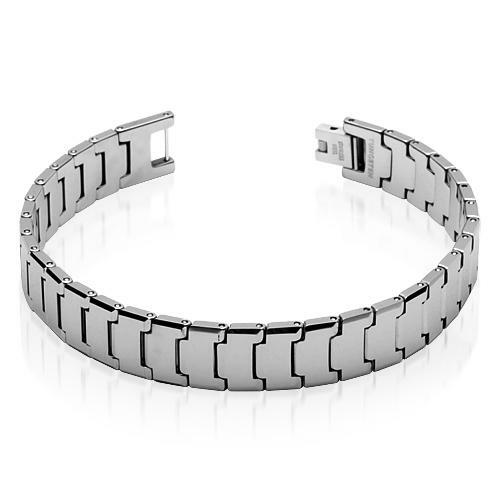 Rach Tungsten Carbide Linked Bracelet 12" or 18"
This Rach Tungsten Carbide Bracelet measures 11 mm wide and is available in 12" or 18"
This tungsten bracelet is cm in length, each link piece measuring a link length if .6cm. Tungsten Fashions bracelets are entirely made from tungsten except for the stainless steel pins & clasp. This tungsten bracelet is heavy polished and laser designed with knot work. As always - same day free shipping! Tungsten Fashions 9 out of 10 based on 24 ratings. 5 user reviews. Q: Can the links be added or removed? A: Yes. Links can be added or removed. I brought this exact bracelet and had to add links to it. Heavy, solid and is perfect for my hubby!